Please refer to the table below for school term dates for the year 2018 – 2019. Timing of the School Day – The day is divided into 6 teaching periods, including Nurture Breakfast with individual classes having staggered break times throughout the morning. 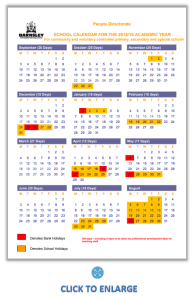 The pupils’ working week is condensed to allow pupils to leave at 12.45pm on Fridays. Friday afternoon is dedicated to staff professional development. The Key Stage 4 curriculum is designed to offer each individual pupil a unique learning pathway. All pupils, using an options process, design a distinctive timetable to meet their individual needs. This curriculum is a combination of work-related learning, off-site provision and classroom based education.